Julius was 6 months old when adopted with his sister Jenny. Having been semi-feral, he is still somewhat nervous, and hisses when he is startled. He loves to be petted and to snuggle when he feels safe, and loves to play with his sister and all his other Kitty Angel friends. 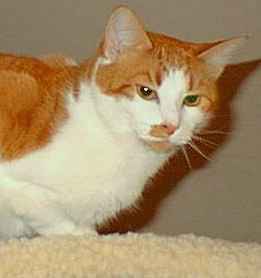 He became Patt & John's seventh 'Kitty Angel' in March 1997. 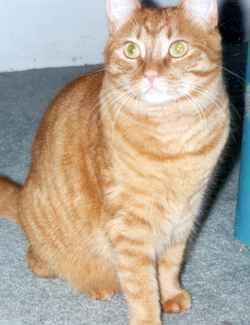 Jenny was adopted when 6 months old, along with her brother Julius. She is still a very nervous girl, and does not like to be picked up. However, she loves being petted and having her head scratched when she is in a 'safe' place. She became Patt & John's eighth 'Kitty Angel' in March 1997. Smokey Joe, on the left, greets Sandy and Tony at the door to get his tummy rubbed. He is a warm, cuddly cat and loves to watch the bird feeder. 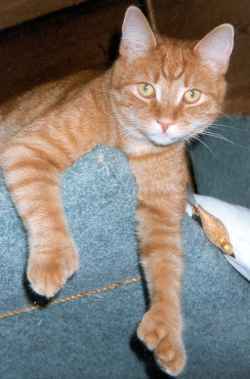 Bismark, on the right, is more laid back and simply enjoys life in a warm house with his two adopted brothers. 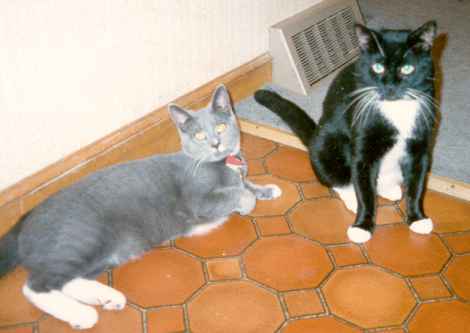 Zeus (top) and Pandora (bottom) are siblings adopted as kittens in July 1993. 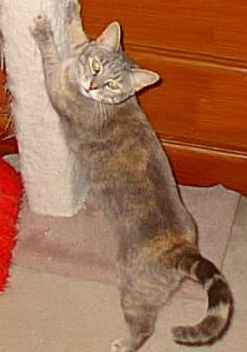 Judy writes that "Pandora has the loudest purr ever!" and that "Zeus is full of testosterone - always looking to start trouble! Of the six cats in the household, Zeus is king!"